Early on in our homeschooling we had attempted to do a study on logic. It must have been their age, or maybe even that combined with the curriculum we were using, but it just didn’t stick. Kyle had done a logic study in co-op this year so I thought it would be good to try again with the other kiddos! 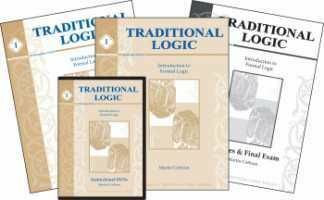 Memoria Press (a favorite of ours) had sent me the Traditional Logic 1 Complete Set to review so I was excited to get started! I like that they mention that it is designed for the teacher with no logic background, because that would be me. I mean, we never studied this in school! 😉 In the set you get the Student Book, a Quiz and Test book, the Teacher Key that has the workbook, quiz and test answers, and a two disc instructional dvd set. This course teaches formal/traditional logic.. I hadn’t asked Kyle which he studied in co-op this year, but there are different kinds. He did mention that this was way different than what they had done. I like that this course was made for homeschoolers. I mean, others can use it, but it makes me feel better knowing that I don’t have to change anything before using it. Generally this course is aged for high school but it does mention that they have used it with 7th and 8th graders as well as adults, so I like that it is flexible like that. Kyle is in 8th and Lauren is in 7th, so it works for us! It is supposed to be a one semester course but they mention that it is generally completed in less than a semester. If you are going to continue with book 2, they give a little schedule enhancement that will shorten the study in book 1 to allow for the more difficult studies of book 2. We just went at our own pace as we aren’t in any hurry and our school year is so different from typical. The thing I loved the most about this curriculum is that every day is written down for you. It tells you what to read and then it lists the questions right after. The DVD set covers all the book chapters. The first disk is Introduction to Chapter 7 and disk two is chapter 8-13. I may have to change my player as I couldn’t tell how long to prepare for each section when we watched it. I know certain players will break it down. Or maybe this was just made as one long disk, now that I think about it. Either way, there are noticeable breaking points when new chapters start, you just have to push stop. None of the sections are very long at all, and really do expand on the information in the book and explain some things in a different way that really helps you understand. We aren’t on a five day a week schedule with most of our schooling, so we aren’t done with this yet, but we are working our way through. I wasn’t sure how Kyle would take to learning logic again, but I really think with the combination of increased ages as well as a better curriculum the kids are actually enjoying it!